This is an intriguing ‘campaign’ that the Connected Learning Alliance has up and running. 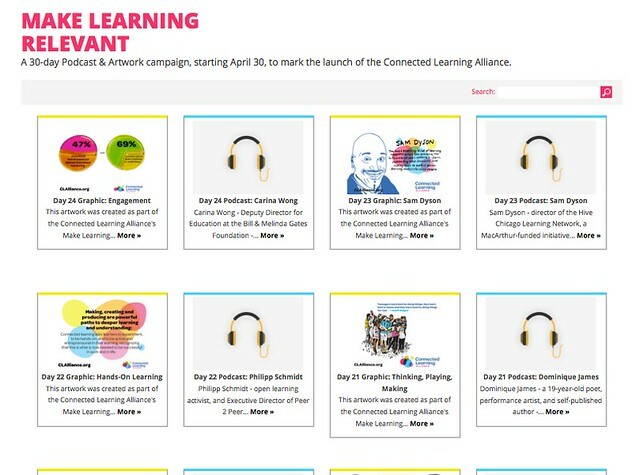 Combining podcast interviews with graphics and art capturing the spirit and ideas of Connected Learning, this project by the alliance is a nice way to dive into ideas. 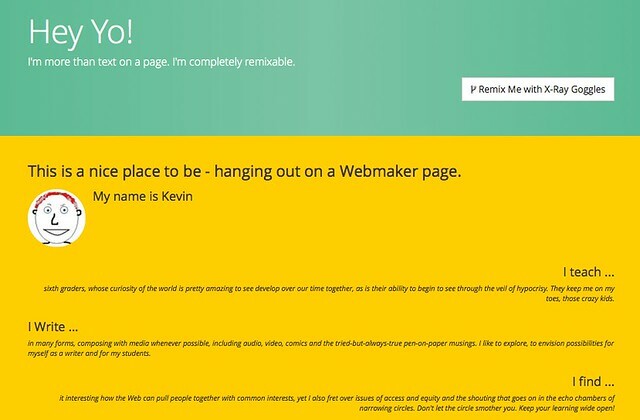 Check out the Making Learning Relevant project. I’m taking some pieces for a remix. I’ll share that out tomorrow, perhaps. I’ve been playing around the new app from Adobe called Voice. It’s very nifty and simple to use, with a clean design. This is how it works: you talk, you choose a visual, you publish. Bam! You’ve created a digital story. You can tinker with theme and music, if you want. Or not. Basically, it seems to have all the things I like about digital storytelling tools. Plus, it has a huge library of icons and images to draw from. It’s not that there are not excellent pieces of journalism floating around the Internet. It’s that finding them can be difficult, unless that kind of task is your full-time job. So, it is always a pleasure when someone else, like Conor Friedersdorf in Atlantic, does it for you. He has collected “slightly more than 100” examples of excellent journalism, and I could spend a few hours moving through them, I suspect. Friedersdorf also curates a Best of Journalism email newsletter. I haven’t yet subscribed but having someone with his lens on the world of quality news and quality writing might be worth the cost attached to getting his newsletter on regular basis, particularly if this collection at Atlantic is an indication of how he works. Story Summary: After reading ESCAPE TO GOLD MOUNTAIN, David H. T. Wong’s account of 100 years of Chinese immigration to North America, I came away from the story feeling disgusted with so many things. First and foremost, I was struck by the level of discrimination and racism that the Chinese have encountered over the years as they left their home to try to build a better life, only to encounter violent racism and political hurdles in the United States and Canada. This is the rhetorical argument that Wong makes in ESCAPE TO GOLD MOUNTAIN as he traces a family’s descendants over the years as the lure of Gold Mountain (which is what the Chinese families called North America) looms large for poor families in China. However, I was also unsettled by the way Wong demonizes just about every white person we meet in the story, except for the periodic politician calling unsuccessfully for compassion in the face of stiff immigration policies aimed at the Chinese. Still, from the building of railroads through the labor of Chinese workers suffering under horrible conditions to the creation of Chinatown slums to the outright violence in some places against defenseless Chinese families, the story told here should ignite indignation in all of us. ESCAPE TO GOLD MOUNTAIN ends with a note of apology, from the governments of both America and Canada for the ways that Chinese immigrants were treated in the 1800s and early 1900s. Wong’s graphic story of the Chinese coming to North America opens a page in the history books that all too often gets forgotten because it puts countries in a bad light. Wong’s story reminds all of us that we need to learn from this history, and find a way to create a better future free from discrimination and racism that lines so much of the past. Art Review: I can’t say I am a big fan of the art here in this book. The simple line drawings lack the kind of complexity and uniqueness in art that would really bring the stories of the family alive to the reader. All too often, the drawings lack depth and clarity, which unfortunately takes away from the reader’s connection to the characters that Wong is highlighting. In graphic stories like this one, the art is what first grabs a students’ attention, almost always, and I’m not quite sure how this book accomplishes that. Which is not to say that Wong is not an artist of talent. It’s just that, in my opinion, too many of the pages here don’t have the kind of vitality and detail that will keep the attention of a young reader. In the Classroom: Certainly, for any unit around immigration and racism (particularly institutional racism and government policies around immigration), ESCAPE TO GOLD MOUNTAIN has a lot of potential value and would add nicely to textbook stories about the Chinese coming to North America for a better life and about immigration itself. As I was reading the book, I could not help but draw some parallels between what I know about other immigration waves from other countries in other time periods, including the more modern immigration debates that seem to center on Hispanic immigrants. History repeats itself, in some ways. But the Chinese endured more overt violence and hurdles than one can even fathom, and still they remain central to the American Dream of a better life. Wong’s story is an important one that needs to be remembered, and not repeated. My Recommendation: I would recommend ESCAPE TO GOLD MOUNTAIN for an upper level high school or university class as a companion text for studies around immigration and racism. There are scenes of violence, and death, in this graphic novel, as Wong does not hold back his punches in telling the story. 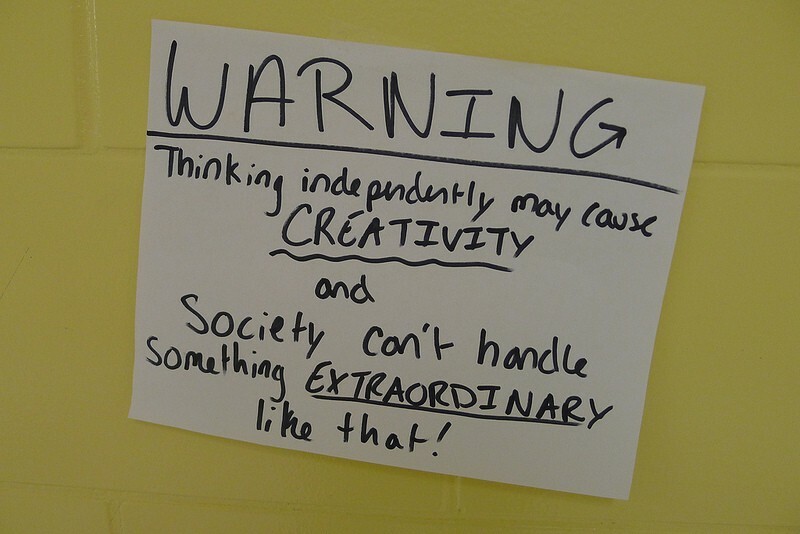 This morning, I read Mr. Bogush’s piece in Medium about your thought-provoking project to hang signs encouraging creativity and independent thought throughout the hallways of your school. I appreciated that you took the time to wrote a letter to Mr. Bogush about the rationale for what you did and why. I want you to know that I, a teacher too, applaud you, and so much of what Mr. Bogush writes in his piece, inspired by your act, is what I believe in, too. Ysabelle, your response seemed reasoned, passionate and a powerful call to action for your fellow students. Your “hacking the hallway”, which is how I think of what you did, sent forth a strong message that no one is in this world is alone but that doesn’t mean we have to think and act like everyone else, either. The world changes for the better not because we shun those who think different and have a tilted lens on things, but because we embrace the crazy ideas that have the potential to become innovative ones. I know enough about Mr. Bogush to know that he admires what you did, and so do I. Although I spend the school year with my sixth graders working to engage them as independent thinkers, so many students have already fallen into the comfortable role of following rules so closely they don’t know where to begin when given a task with no directions or specific outcomes. This is not their fault. It’s society’s fault. It’s us as parents who micromanage their days, and it is us as teachers who have clear expectations that narrow the possibilities of learning, and it is the world at large that casts a sneer at anyone with an original thought that falls outside of expectations … until that thought becomes something that alters the way we engage with the world (prime evidence: the admiration crowd surrounding the myth of Steve Jobs). Your project reminded me of a Hackathon that I joined during a convention of teachers in Las Vegas a few years ago. Like you, we decided to “hack the hallways” by posting sticky notes on the artwork that was hanging throughout the convention center. Yes, even teachers like to be creative and break the rules. The task was to spark thinking in our fellow teachers in the convention, and to use the public artwork on the walls as a space for art. It was a blast, and even more importantly, there were a lot of teachers who asked what we were doing and who stopped to read our satirical notes. We hope we made a difference, just as you do. The convention center staff was not pleased, however, and some followed a few minutes behind us, ripping down our hacked signs as if we had used Sharpies and not sticky notes. It didn’t matter. The point had been made. Pictures had been snapped of the hacked art and the hacked notes were shared in online spaces, becoming a viral part of the conference. Our mark had been left behind. The same goes for you, Ysabelle. Sure, your signs were probably taken down at some point. But the signs were only temporary outposts to your thinking, and yes, you have “accomplished more than just helping a few people…I have hopefully made every reader of this article’s day better,” as you write in your letter to Mr. Bogush. You did with me, Ysabelle. If you ever find yourself in Western Massachusetts, Ysabelle, I invite you to come hack my classroom. Hang posters up all over the place. Spark my students to think creatively and independently. Take what you’ve done there at your school and pay it forward. In some ways, your poster brigade is a small act with small ripples. But ripples can become waves, and waves can change the world. Thank you, and thank you to Mr. Bogush for sharing your story. There’s no easy way to describe this old project (which can now be found housed on a Webmaker Thimble Page). It is my first real venture into multimodal composition. I had just bought a Flip Camera, which no one had ever seen before, and had this idea for a poem that used three different videos, merging into one experience, so I asked some NWP friends at a Tech Matters retreat in Chico to blink into my camera and repeat the words “blink blink blink” for me. They no doubt thought I was crazy and could not figure out what I was doing, and I could not explain it, either. I taught myself some basic html coding and worked to bring it together. I’ve hosted the poem itself in a few places over the years, often stifled and frustrated by the limitation of web hosting spaces that would not allow three videos to run simultaneously, as is required with this poem. 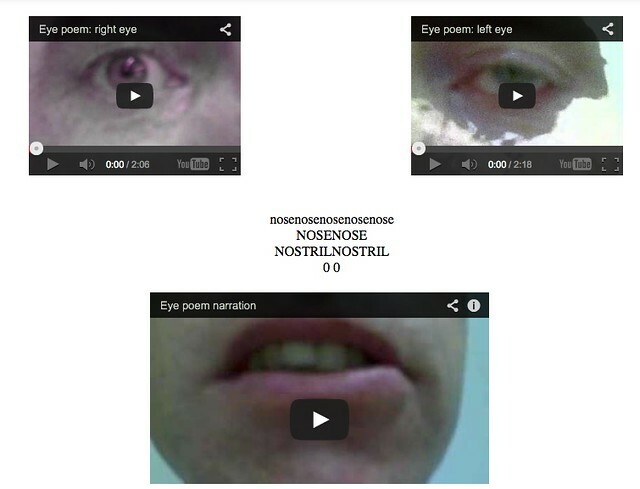 The idea is that you click “play” on all three videos, and then center your own eyes on the nose. This allows you to experience ‘the face’ of the poem. (I know, it still sounds crazy). I included the text of the poem and also recorded a reflection on the process of writing and making the poem (which was interesting to listen to this morning … eight years later). Confused? That’s OK. It was an experiment. I still find it intriguing and came back on it this morning for a blog post I am writing for the National Writing Project. It then occurred to me that Thimble might be the right place to host the poem, and it worked! I did a little cheer. I’m still tinkering a bit with the html code but not too much. I like the idea of preserving it as much its original form as possible. 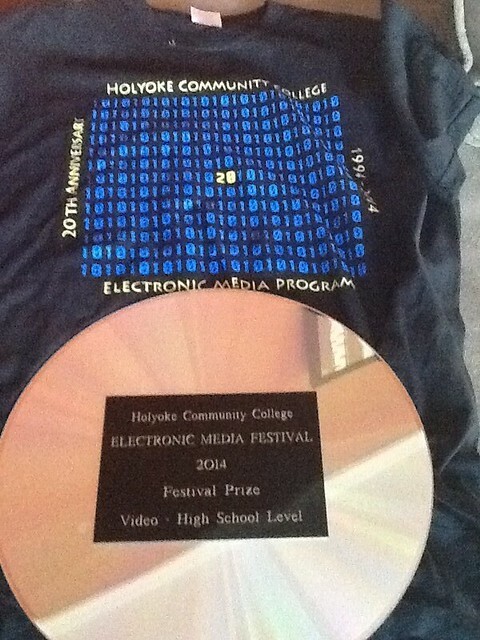 My eldest son and high school friends recently won an award from an Electronic Media Festival that took place at a local community college. He submitted a short film that he and his friends shot in the high school category, and their movie came in second place. We had a scheduling conflict, so we could not go the event itself, but apparently, they showed the winning movies on a massive screen, which is pretty neat. And he got a neat engraved Laser Disc as an award. Here is their movie short (the ending is a bit too violent for my tastes and the whole thing has an purposefully creepy feel to it — right down to the soundtrack). You’ll notice at the very end a reference to a larger movie project that has been in the works (and might be on hold right now for all I know) for a full-scale zombie movie that they have written together collaboratively. I’m having as much fun making promos for the Making Learning Connected MOOC as I will be doing the MOOC itself. Ha. Please consider joining us for playful learning this summer, and pass this short video along to friends. Where: Via Google Hangout on Air from Educator Innovator Webinar page. Making Learning Connected (also known as #clmooc) is a collaborative, knowledge-building and sharing experience offered through Educator Innovator. It is open to anyone interested in making, playing, and learning together about the educational framework known as Connected Learning. 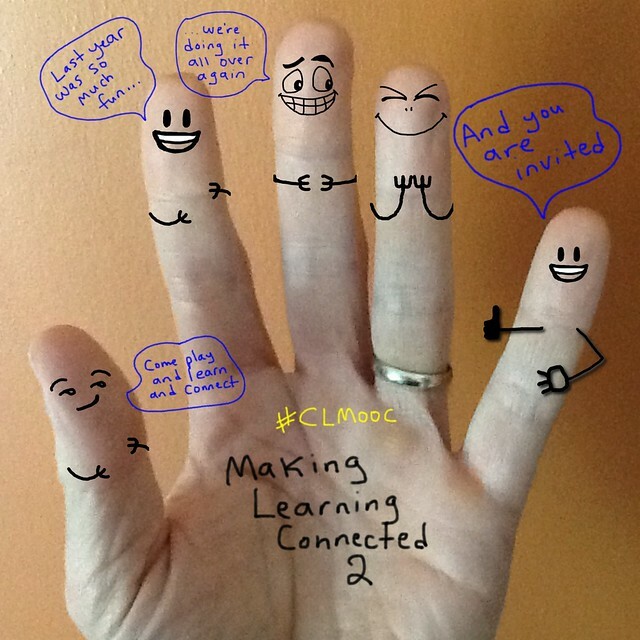 In #clmooc, educators of all types have an opportunity to play with new tools, make projects and friends, and share projects and reflections with colleagues across the country and around the world. Join members of the Making Learning Connected 2014 team as they discuss the plans for the upcoming summer, how to get involved, and why “you’re in the right place” if you participate in #clmooc. Come check out the hangout for information on the launch of the CLMOOC in June. Plenty of room for you!